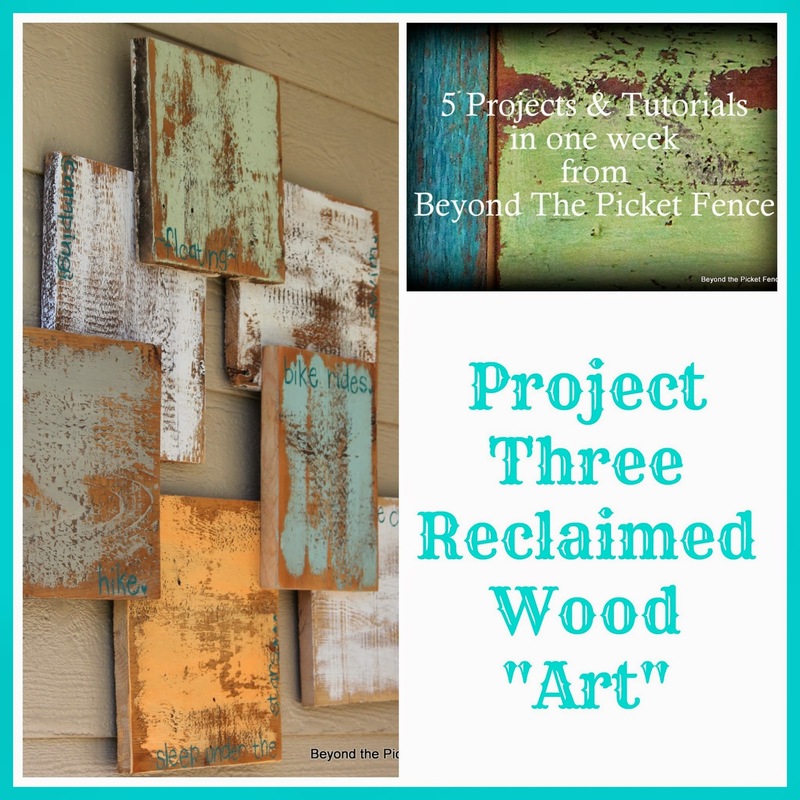 Beyond The Picket Fence: 5 Projects in a Week, Project 3, Reclaimed Wood "Art"
Now, trust me, I use the term "art" loosely. I realize this is more wall filler than art, but it fits my needs--something with a little color, something made from free materials, something personal for our family. I picked 7 boards that were similar in size and painted and sanded them. I wanted a lot of white to tie in the white porch railing and front door. I laid the boards out upside down in a pattern that I liked and screwed them together. I then hand painted and lettered a word or phrase on each square that has something that we love about summer: hike, sleeping under the stars, camping, riding bikes, ice cream, swim, and floating. The words are small and you certainly can't see them from the street. But friends and family that join us for a nice sit on the porch will see them and they make me smile, loking forward to all the goodness summer has in store. Art shmart--if it makes you happy it doesn't matter what you call it! Tune in tomorrow for another project! If you are looking for my link party--it will be this Saturday! You have been having some great ideas with wood art. Just got back from my son's farm and brought home some old barn wood he was going to burn. This gives me inspiration! Becky, I love the addition of the summer words. I cannot wait to check out the rest of the series. I definitely need some porch inspiration around here! Have a great weekend!